If drones like the Parrot are related to Predators on one side, on the other side they're related to toys: plastic radio-controlled planes and helicopters. But their range, power and additional sensors and smarts make drones something much more. They're an extension of the person operating them, vessels for that person's consciousness, capable of disturbing the universe in ways that go far beyond play. It's a visceral feeling with the Parrot; one can only imagine what it's like to fly a Reaper, though a report released by the Pentagon in December 2011 gives us some idea. Even though they work from the safety of air-conditioned bunkers and go home to their families every night, almost 30% of Air Force drone pilots suffered from burnout, and 17% were clinically distressed. They may not have been in danger, but some part of them was nevertheless in combat. For most other Americans, the experience of drones is limited to celebrity cameos. They're characters in popular culture. Last fall Saturday Night Live ran a sketch about four drones that formed a hot new boy band. A joke YouTube video from 2012 purporting to show a quadrotor pimped out with a machine gun has racked up 16 million views. A squad of nimble, agile quadcopters from the University of Pennsylvania performed a son-et-lumière dance number at the Cannes Film Festival. Up close, the reality is a bit different. There's something uncanny about drones. Flying one is a heady experience, but being watched by one is an eerie, oppressive, somewhat annoying feeling  wielding the Parrot in public will get you a range of reactions, from "OMG I have to try that" to "Get that giant bug out of my face." They're machines with ghosts in them, and the ghost is saying, "I can see you, but you can't see me." It's roughly analogous to interacting with an anonymous commenter on a blog: you're dealing with someone who is both present and absent, who has decided that what they say or do will have consequences for you but not for them. Drones bring that asymmetrical dynamic out into the real world: a drone is the physical avatar of the virtual presence of a real person. They provoke a new kind of anxiety, quite unlike the nuclear terror of the 1980s or the conspiracy-theory paranoia of the 1990s. They're a swarming, persistent presence, low-level but ubiquitous and above all anonymous. They could be al-Qaeda or your government or your friends and neighbors. Businesswise, the Parrot is still a product looking for a market beyond well-heeled dronophiles. Unless you find aerial photography extremely personally gratifying (which, granted, a lot of people do), the Parrot doesn't have a lot of immediate practical applications. Which raises the question: What are drones good for, aside from hunting people? The answer, it turns out, is a lot, and more all the time. U.S. Customs and Border Protection has been using Predators to monitor the Mexican border since 2005. It currently fields a fleet of 10 and has put in for 14 more. Last fall, NASA used a Global Hawk to study Hurricane Nadine. But flying a drone for purposes other than recreation requires a certificate from the FAA, and those certificates are hard to come by. The government is working to correct that: last Valentine's Day Obama signed the FAA Modernization and Reform Act, which among other things ordered the FAA to establish six drone-testing ranges, fast-track requests for permission to use drones and figure out a scheme for their integration into U.S. airspace by 2015. So far the list of applicants for permission to fly drones consists mostly of universities, public agencies and drone manufacturers. According to its FAA application, Washington State's department of transportation wants to try using drones for avalanche control. The U.S. Department of Energy plans to use a helicopter drone to take air samples. The Forest Service wants drones to help fight fires. Police departments in Maryland, Alabama, Texas, Florida, Washington, Arkansas and Utah have all sought permission to fly drones, encouraged by a $4 million Homeland Security program to accelerate the adoption of drones by local law enforcement. 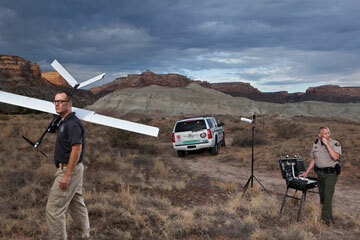 The Mesa County sheriff's office in Colorado was one of the first to use drones in police work. It currently fields a Draganfly X6 and a fixed-wing drone called a Falcon UAV. "If it's a tactical operation, like there's a barricaded subject or something of that nature, we'll use the helicopter," says Ben Miller, director of Mesa County's UAV program. "Also aerial photography. We can fly 50, 60 ft. [15 to 18 m] off the ground and literally photo-map an entire crime scene." The Falcon, which flies faster and longer but can't hover, is used to sweep wide-open spaces for, say, lost hikers. "We do it because of cost," Miller says. "If it wasn't for cost, we'd just go out and buy a [conventional] helicopter." For now  as with PCs in the 1970s  much of the serious hacking and tire kicking is still going on in university labs and among hobbyists who build, modify and fly their own drones for fun. DIY Drones, a flourishing online community founded by former Wired editor Chris Anderson, has more than 30,000 members. But the drone industry is ramping up for a big landgrab the moment the regulatory environment starts to relax. At last year's Association for Unmanned Vehicle Systems International (AUVSI) trade show in Las Vegas, more than 500 companies pitched drones for filming crowds and tornados and surveying agricultural fields, power lines, coalfields, construction sites, gas spills and archaeological digs. A Palo Alto, Calif., start-up called Matternet wants to establish a network of drones that will transport small, urgent packages, like those for medicine.